King at the NNJFC annual breakfast. THE New Norfolk Junior Football Club held its annual breakfast for all junior teams last Saturday, July 15. It was a great turn out with plenty of hungry children and their parents attending at the NNDFC. 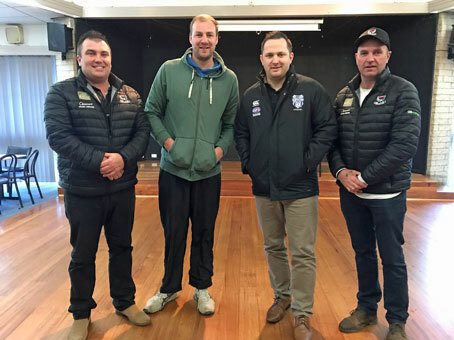 Guest speakers for the occasion included former Essendon ruckman Jason Laycock who is now playing with the New Norfolk Eagles. He gave a great insight into his days growing up as a junior footballer on the North-West Coast and how his journey led to becoming an AFL footballer. Tasmanian Football Council general manager Jackson Hills then spoke of the importance of junior clubs with in our communities and how important volunteers are to the make-up of junior football. The final speaker was NNDFC senior coach Matthew Smith who talked to the juniors about the importance of listening to their coaches and how they can give you the best chance of playing senior football. He also reminded the youngsters to enjoy their football first and foremost. It was very pleasing to see coach Dean King and his Under 17 girls' team in attendance. This is the first season New Norfolk has fielded a female team and they must be congratulated on their efforts this season. All the juniors had an enjoyable time and this continued when many went over to Boyer Oval to watch the Eagles' senior teams in action against Claremont. A big congratulations goes to the NNDFC Old Players who once again put on a lovely meal. Thanks also to the senior footballers who attended - the kids loved it. This event has been running since at least the 1980s and this breakfast was as god as any. A special thank you to NNJFC committee members David Banks and Vanessa Britten for a job very well done.